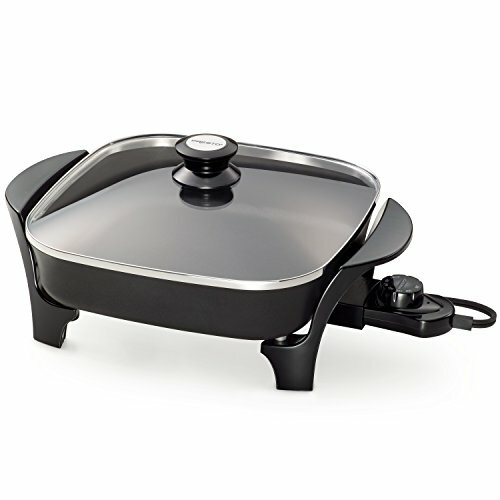 The Hamilton Beach 38500 Skillet Combination is a two in one skillet and griddle. The top portion is removable so you have the full surface area for a griddle when needed. The unit is 11 ½ X11 ½ as a skillet and 12 ½ X 12 ½ as a griddle. The sides are 2 ½ inches high, which will enable you to cook up to 4 quarts of chili, stew or soup. If you have a small apartment or need an extra burner, this unit will be a great investment. The Hamilton Beach 38500 Skillet Combination enables you to fry, grill, sauté and stir fry. The nonstick surface makes cooking a breeze. It is healthier as very little or no oil is needed for cooking. It is easy to clean and dishwasher safe. The handles of the Hamilton Beach 38500 Skillet Combination stay cool even during cooking. This allows you to take your food from stove to table with ease. The unit is very compact and stores upright, using very little space for storage. The Presto 06852 16 Inch Electric Skillet is perfect as an electric skillet and an electric griddle, saving you space in your kitchen. It also doubles as a buffet server when entertaining guests. The temperature control is very accurate, which makes cooking both faster and easier than on the stove. The Presto 06852 16 Inch Electric Skillet is made of heavy cast aluminum construction with a nonstick surface that provides easy clean up. The skillet can also be immersed and is dishwasher safe as long as the heating control is removed. The Presto 06852 16 Inch Electric Skillet has a 16 X 12 inch surface with 2 ½ in depth. This size makes it great for cooking, sautés, stir fry, roasting, frying, grilling, stewing and even baking. It does not heat up the house like the oven does, so baking in the summer is energy efficient and easy. The tempered glass lid makes it so you can watch what you are cooking. This is great for items like bacon, where you need to cook it a specific amount of time and the look of the food is everything. The Presto 06626 Electric Skillet glass is made with the same high quality as the Presto 16 inch skillet, but the smaller size is perfect for individuals and couples. The 11X11 skillet still has the 2 ½ in depth. This makes it perfect for cooking a wide variety of foods. This includes roasting, frying, grilling, stewing and baking. The temperature control keeps the surface at a steady temperature and can be set from 200 to 400 degrees. There is also a warm setting when using it for entertaining. 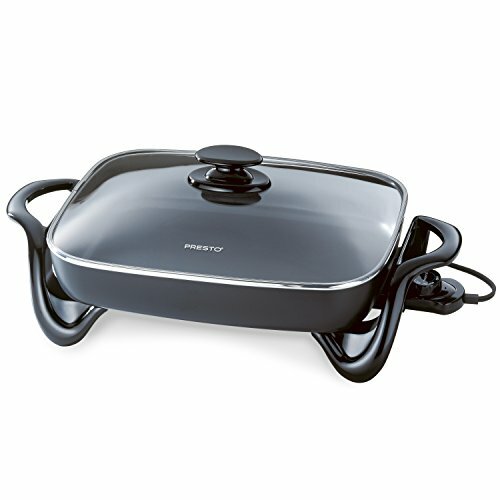 The Presto 06626 Electric Skillet comes with a tempered glass lid and a deluxe nonstick surface. It has very easy cleanup and is dishwasher safe as long as the heating control is removed. The 1000 watts takes less energy and does not heat up your kitchen. This is a terrific benefit in small spaces like apartments and RV’s. If you need an extra burner or want a portable skillet, the Presto 06626 Electric Skillet is an excellent skillet with a wide range of uses.